Remember George H.W. Bush, Jack Kevorkian, Jean-Bertrand Aristide, “Peace In The Middle East,” and Rodney King? Yes, the world was very different, then. The album cover was immediately striking. Why? The gun. Yes, there had been guns on Rap album covers before, but this gun – this gun was pointed at me (… and you) while we were lying down looking up at it. This is not a position anyone wanted to be in, of course, but it was happening. “Straight Outta Compton,” while profane, was rather pro-black militant, however. The album opened with the Dr. Dre exclaiming “you’re about to witness the strength of street knowledge.” It was on! The spotlight on California was being turned up and rap music was publically growing up. The album cover for “Straight Outta Compton” has been lauded as one of the best album covers – ever. It communicated what had been simmering in the consciousness of Los Angeles for many years , communicated what was happening at the time and it foretold the direction that the music (and the world, frankly) would take. Thanks to photographer Eric Poppleton for capturing this vivid image. The MP3 has not only been birthed, but is now all grown up, and is a standard for how music is not only transferred digitally, but consumed by the music buying public. Record stores – virtually closed or hanging on by a thread. Cassettes – nostalgic. CDs – passé. Vinyl – what is that? I often remark how I miss having physical album art, because I learned a lot about the background of the music having it, and I also had something cool to put on the wall. Album art, however, is not prevalent, because music isn’t consumed as a physical product anymore. 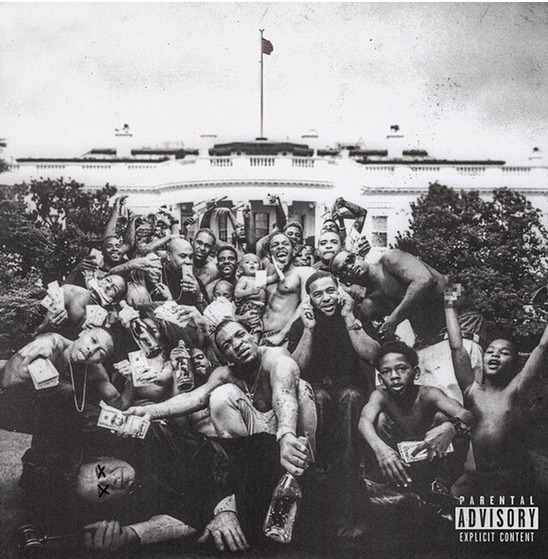 It’s in this context that the excellent album cover for Kendrick Lamar’s “To Pimp A Butterfly” emerges. Now, I’ll admit, the fact that both of these artists are from Compton didn’t dawn on me when I made the decision to talk about these two covers, but I do find the fact interesting. While in 1988, “Straight Outta Compton,” was bold and brash, in 2015 we are virtually desensitized to such content. So, I’m going to make a statement now that you may disagree with. If we took the album cover for “To Pimp A Butterfly” and placed it in 1988, it would be even more controversial than the “Straight Outta Compton” artwork. In 1988 the country was still very conservative and rap music, as a phenomenon, was still young and evolving. An album cover depicting overzealous, shirtless black men holding stacks of money, champagne and children while standing on the white house lawn and crushing (to death) “the law” would have not only outraged White America, but would have infuriated Black America. What’s even more startling is that the image that is depicted, while not actually being the norm today, is the most common depiction of black men that we see. If we piece together the time between “Straight Outta Compton” and “To Pimp A Butterfly” the arrival at this cover makes perfect sense. It’s today. It’s now. It’s post-crack. It’s post-Katrina. It’s post-Iraq. It’s post-Tech boom. This is how black men are seen by the world – uncontrollable, sexualized, not law-abiding and careless. Album cover art isn’t insignificant. I’d argue the packaging is as important as the content. It communicates the artist’s vision, and it also serves as a slice of life for where we are as a society at that moment. From “To Pimp A Butterfly” where do we go from here?